The stylish Rambler is a nimble and responsive ride! The Rambler family includes the All Terrain and the electric E.V.O. After releasing the Rover and opening the door for people who never thought they’d enjoy cycling again, we found many customers wanted more. So that’s just what we gave them. The Rambler has the same high seat and straight-forward frame geometry as the Rover, but with many upgrades for riders who want to go faster and farther. It features a sleek Y-frame design which improves the Rambler’s handling and stability. It is available with up to 30 speeds and is about eight pounds lighter than the Rover. What really sets the Rambler apart, however, is the feel of the ride. It responds beautifully through corners and the lightweight chro-moly steel frame ensures a smooth ride. For tackling those off-road riding adventures, the Rambler All Terrain is ready to take you beyond the paved trails and then back again. The seat mesh is breathable and is fitted across a lightweight aluminum seat frame. Along with standard disc brakes and full seat adjustability, the Rambler is a quality machine for casual and serious riders alike. The frame comes in a stunning Tangerine Orange or Arctic White finish (x30 level only) with complimenting graphics. 20″ wheels come standard with 24″ and 26″wheels available as an optional upgrade at additional cost. The NuVinci is internal, while the other models have external drivetrains. This gives the rider the option to choose which gearing type they prefer. The seat height allows riders to easily get on and off, and provides good visibility. The lightweight aluminum seat frame reduces crucial weight. The top level Rambler features the Comfort Mesh seat, for increased lateral support. Offset ergonomic handlebars accommodate most trigger shifters. Available on the x16 and x30 models. The horizontal handlebar position gives the rider responsive handling to steering inputs, and gives the Rambler a tight turning radius. Premium steering stack with bushing/bearing combination for smooth steering. Rapid axle allows for easy removal of front wheels. 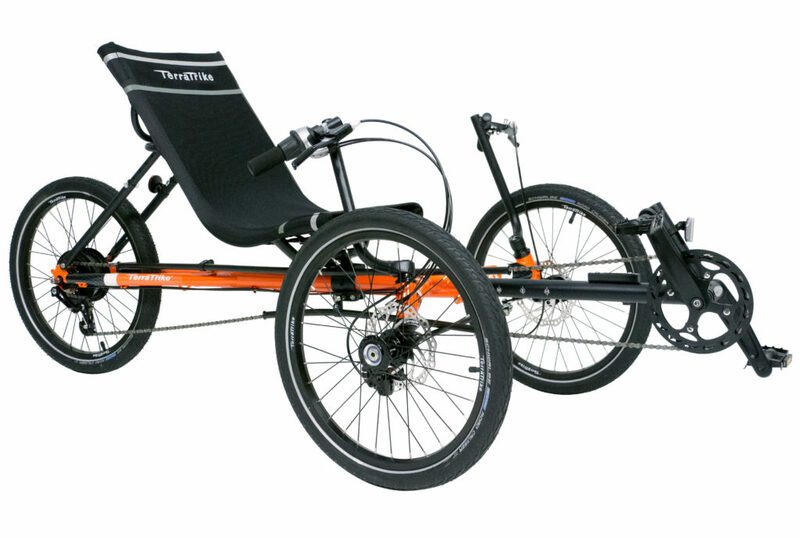 Just wanted to let you know how wonderful the Terra Trike Rambler is!! I have MS and have not ridden in years did not feel like my balance was good enough, well the Terra Trike changed all that, I feel safe, comfortable and above all free!! I have named mine “Liberty” because it gives me the freedom to be outside, moving and enjoying physical ativities that usually I cannot participate in, Thank you again, keep up the great work!! I just received my TerraTrike Rambler this last Tuesday. My wife and I both ride it. My wife really likes the trike and I found that I have to take turns with her in riding it. It is just a fun way to get around. I am going to take it on the New River trail ride in the morning when it is cool. Thanks for designing and building a great American Made product.